There’s no escaping the fact that becoming proficient at guitar or any instrument such as ukulele, is a long journey. If you are an acoustic guitar beginner, this article will show you 10 tips to take care of  your hands when you practice guitar right from the start. So that you may not give up soon or even still play with wrong techniques accumulated day by day. Playing a guitar with high action can always cause badly-sore fingertips and difficulty for your improvement. So, the very first thing you should do is giving your guitar action a check. But, how can you know whether the action is high or low? 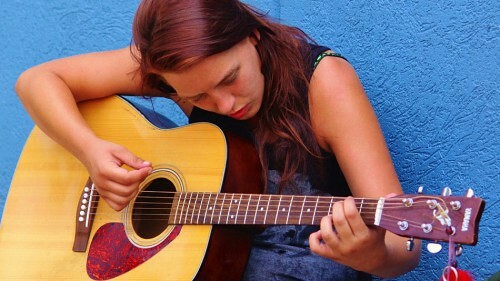 Just grab your guitar, play and feel it. If it hurts your hand and you have to put more effort into pressing the strings than normal, it means the action is high and need to be tweaked. In case you can not handle the action yourself, bring your guitar to the store where you bought it, or send it to music centers to have it adjusted, or simply buy a good quality guitar right from the beginning to avoid the above trouble. 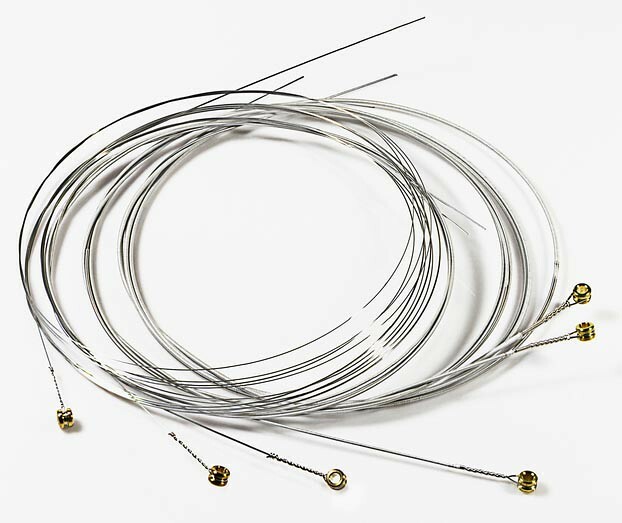 There are many types of strings for both acoustic and classic guitars. Picking inappropriate size of guitar strings may not only hurt your hand but also slow down your process. In fact, the light string will be easier to play and less painful than medium or heavy strings. For this reason, as a beginner, you should use the thinnest, lightest, and lowest diameter type of strings, then you can gradually replace them with larger diameter strings later. You need to warm up your muscles before making them work hard. And in this case, they’re your hands muscles. No matter what you want to be, a guitar talent or just a for-fun-player, doing hand warm-up before playing guitar does play a very important role in boosting the toughness and reduce the risk of injury. Always warm up hands carefully. Boost toughness for the hands frequently with typical warming up workouts. Warm up hands and arms with warm water in winter. Always keep your hands warm in clothes and gloves when it’s cold. Keep in mind that even masters of guitar still spend a sufficient amount of time for warming up before playing guitar, so you should not ever underestimate that (though sometime you may feel it so boring like I feel most of time). This is a very common mistake in learning guitar when guitar learners play non-stop till their hands get serious injury. A lot of people want to take a shortcut in practicing guitar so they increase the intensity of guitar workouts suddenly. This factor makes their hands and arms not able to adapt in time as well as leads to injury. Take a break at least 10 minutes after each 45 minutes practicing. Keep a stable intensity as practicing. Stop practicing immediately when your hands and arms are hurt or else your pain will be worse. It’s so funny that for a guitar player, the calluses is more than a scar on the fingertips, it’s exactly a medal for his/her hard work. So, a lot of beginners are too eager to practice for getting calluses at any cost. However, wrong methods of getting calluses may make your effort drift down the drain. 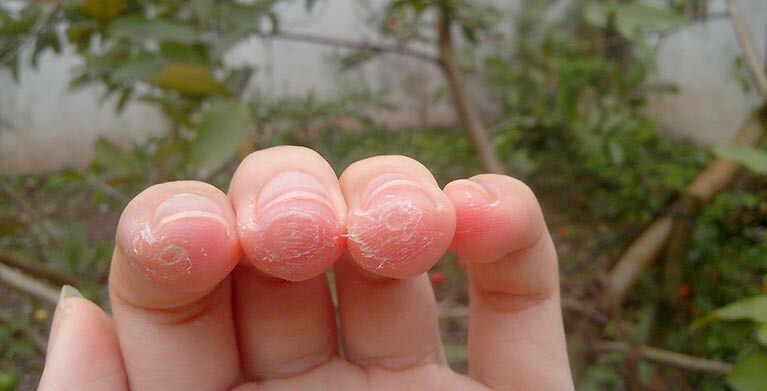 Calluses formed after persistently guitar practicing are a natural side effect of guitar learning. If you persevere after a few weeks, the calluses will form and you will no longer feel painful. But once your calluses appear, you should keep practicing regularly because if you stop playing for just a period of time, your hand will be hurt again. Yes, it’s just like any other sports. Sore fingers are a part of guitar practice and sometime it can make you change the way you play and flip and lead you to apply the wrong method. So try to play with the correct position, and make sure your fingers are pressing in the right way all the time. 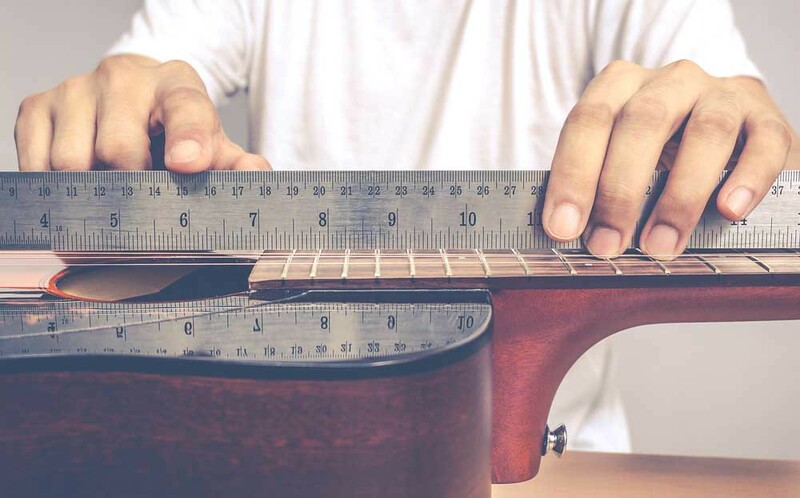 Personally, existing incorrect habits of the wrist and finger position are extremely difficult to overcome, and they are bad for your long-term guitar practicing process. Therefore, you need to take great care of the way your hand press on the fret board, even when you feel hurt in your fingertips. Another problem is that a lot of guitar learners often put too much stress on the hands when they press the fret board. If the hands are not strong and tough enough, it will definitely cause wrist pain. Make sure the strings are not too tense, because tense strings require more strength to press.. 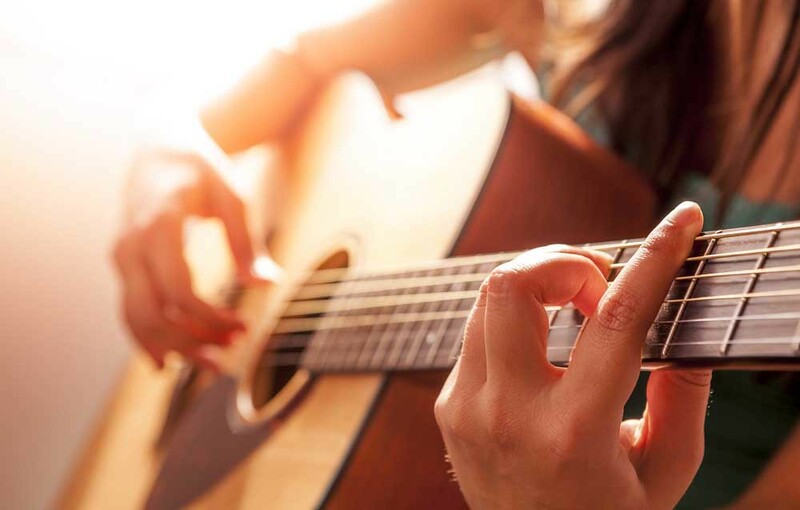 This tip to take care of your hands may sound unrelated but getting enough sleep is an important part of avoiding hand injury as playing the guitar. When you are sleeping, not only your hand muscles but also the whole body can automatically recover and get new energy for daytime activities. Long-term insomnia will cause the body inflexible, fatigue and lack of energy. It also slows down your activity and lead to pain in your hand. Therefore, you should always get enough sleep and sleep on time. 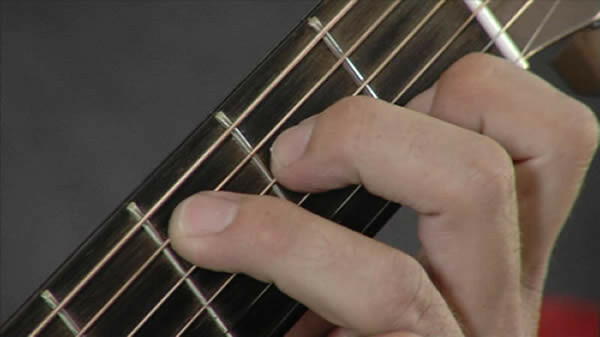 Fingernails on your hand can make fretting difficult and reduce your practicing speed if they are not trimmed in the right way. It’s highly recommended to keep the nails on your fretting hand not extend past the fingertip. Additionally, don’t ever bit or rip your nails off because this can cause pain and many other unpleasant side-effects. Want to go far on the way? Just make small things perfect, start with your nails. 10# Don’t touch your guitar when your hands have been in water for a period of time. While stretch marks are considered as mothers’ sacrifice, as I once said, calluses deserve to be considered as guitar players’ medals. 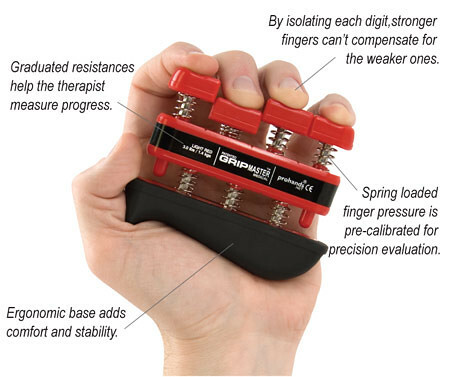 Do you remember how hard you tried to form your calluses? If so, love any calluses like you love your own guitar and keep an eye on them in your everyday activities also. Practicing guitar when your hands are still wet is the fastest way to shred your calluses. Wait until your hands are dry perfectly so that calluses can be ready for practicing. In conclusion, taking right care of the hands is one of the two keys to improve your guitar skills quickly, beside making persistent efforts. Hopefully these 10 tips will help you guys with taking care of your hands, enjoying your guitar practicing and getting success soon.